Everyday Democracy is part of a broad coalition that helped launch Connecticut’s Civic Health Index Research Reports (2011, 2016). The Coalition also serves as the foundation for the Connecticut Civic Health Project and Advisory Board, and the Connecticut Civic Ambassadors Initiative. Co-Chairing the Connecticut Civic Health Advisory Group are: Connecticut’s Secretary of State Denise Merrill and Everyday Democracy Executive Director, Martha McCoy. In 2011, the first CT Health Index Report was issued that looked at key civic indicators in the state such as how residents engage in civic organizations, how attentive they are to community problem solving, and politics, and how connected they are to family, friends and neighbors. Following the release of the 2011 index, 50 stakeholders established the Connecticut Civic Health Advisory Group, co-chaired by Everyday Democracy’s Martha McCoy and Secretary of the State Denise Merrill. The group created the Connecticut Civic Health Project that works on the recommendations based on the reports’ findings and encourages civic participation throughout the state. A subsequent 2016 CT Health Index Report was issued. Follow the CT Health Project on Facebook. 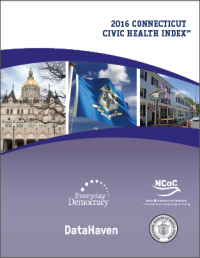 The 2011 and 2016 Health Index reports for Connecticut followed a 2006 national Civic Health report issued by the National Conference on Citizenship (NCoC) and they serve as a model for other states trying to gauge and positively impact civic engagement. 2011 Report Overview: Some experts have used the term “two Connecticuts” to bring light to the disparities that exist based on wealth, race/ethnicity, and education in the state. Two very different pictures of Connecticut emerged: one that is highly civically engaged and another far more disconnected from civic life. Being white, wealthy, or college-educated was linked with higher rates of political engagement, volunteerism, group participation and community leadership. While all people of color had lower levels of political engagement, Latinos were especially underrepresented in political life. 2016 Report Overview: Data collected for the 2016 report shows a small but noticeable improvement in voting participation, compared to data in the 2011 report. It also shows rising civic engagement in some areas – working with neighbors to fix community issues, contacting public officials, eating dinner with family, and talking with neighbors. With this report, we were able to provide richer information about the civic health of our state by supplementing national census data with neighborhood-level data from DataHaven’s Community Wellbeing Survey of over 16,000 adults in Connecticut. Here are the recommendations from the report. Partners in the Index reports include: Secretary of State, Denise Merrill, the National Conference on Citizenship (NCoC), and DataHaven. In order to further the the work of the Connecticut Civic Health Project and act on the recommendations in the 2011 and 2016 Index reports, Everyday Democracy, along with Connecticut's Secretary of State Denise Merrill and other partners, launched a Civic Ambassador Program in September of 2017. This initiative empowers residents to become catalysts for civic action that can lead to stronger civic health and REAL socioeconomic benefits, in terms of social capital and community well-being. Learn more and sign up to become a Civic Ambassador. Student organizations at UConn, together with Civic Health Project partners, have hosted several events focusing on the topics of voting, working for electoral campaigns, community engagement and volunteering. The Civic Health Project has worked with the State Department of Education, which led to the development of new civic education resources for teachers and provided input to Connecticut's social studies framework. In 2015, the Civic Health Project launched the Connecticut Youth Conversations and Action on Mental Health Project. Over 800 high school students in the Greater Hartford area attended facilitation training and dialogues on mental health using the national Text, Talk, Act platform. The Youth Conversations Project built facilitation, leadership, and advocacy skills among young people. It is important to have people from many backgrounds in positions of power. The Civic Health Project set out to increase the number of women and people of color getting appointed to state advisory and policy-making panels. As a result of their efforts, the state’s women’s and minority legislative affairs commissions created awareness about their updated State Boards and Commissions Talent Banks (databases of people interested in serving on a board or commission). Over time, there has been a slight improvement in the level of participation of minority groups on government panels, but more progress still needs to be made. In September 2012 the Secretary of State's Connecticut Election Project launched webinars and materials for teachers and students (8th -12th grade). These resources helped teachers integrate materials about the Presidential Election across the curriculum. This is a landmark effort that is gaining visibility and significantly strengthens civics education in the state. CT-N (The Connecticut Network, a public affairs station), a member of the Civic Health Project, developed a series of videos with information on voting, testifying at public hearings, and advocacy. The videos are meant to serve as resources for the public to become more engaged in civic life. Members of the Civic Health Advisory Group participated in the videos, which are available for download and streaming on the CT-N website. In response to the 2011 Civic Health Index finding that Latinos have a low rate of political engagement, the Hartford Votes/Hartford Vota Coalition and the Hartford Public Library conducted neighborhood canvassing of 124 potential Latino voters in 2012. Overall, they found that canvassing had a positive impact on voter turnout. Sixty-four percent of the canvass participants voted in the 2012 midterm elections. Those who were canvassed twice voted were 21% more likely to vote. The Civic Health Advisory Group has been sharing stories and lessons from this initiative to encourage the growth of voter outreach programs in Hartford and across the state and country. Largely through the efforts of Secretary of the State Denise Merrill, in 2012 Connecticut passed An Act Concerning Voting Rights which eased the process of voter registration for eligible adults. The act introduced online registration to supplement the existing mail-in system. The state legislature also passed Same Day Registration, which allows residents to register and vote on Election Day. In so doing, Connecticut made voting more accessible, especially for youth, elderly, and communities of color. The Civic Health Advisory Group worked with several partners to launch the online Connecticut Civic Participation Resource Guide on the United Way 2-1-1 website. The Guide provides information, contacts, and resources on topics that include volunteering, civic participation, voting, and donating. Lesson Plan 1 is an introduction to "civic health" and its connection to "great citizenship." Lesson Plan 2 is an introduction to Chapter 3 in Eric Liu's book The Gardens of Democracy, which discusses the attributes and value of "great citizenship" for our society and democracy. Lesson Plan 3 helps teachers engage their students on "living citizenship" through classroom and personal civic engagement activities by the students using a "civics scorecard." If you are interested in partnering with Everyday Democracy to host a Community Conversation based on the Civic Health Index or if you are interested in becoming a Civic Health Ambassador, please contact Valeriano Ramos at vramos@everyday-democracy.org or (860) 727-5967.